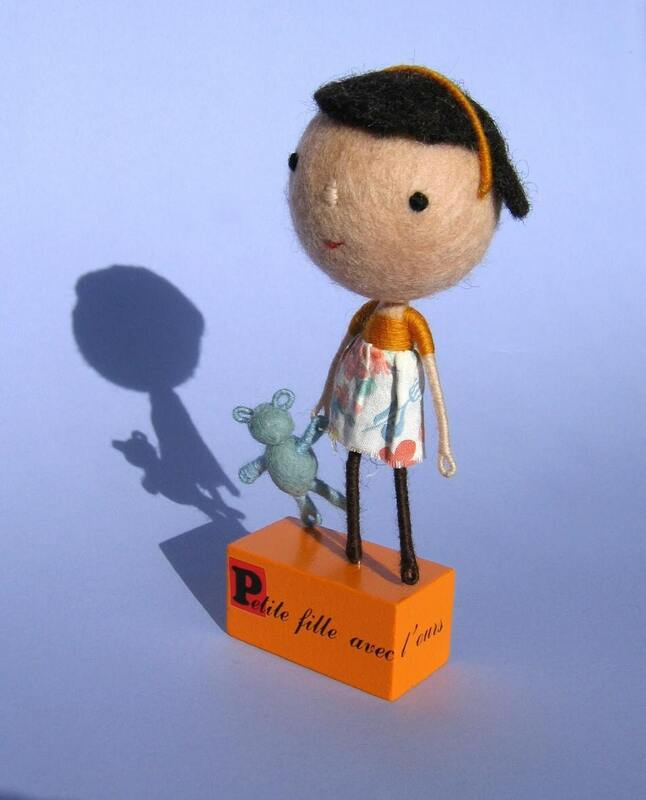 Phillipa England of Felt~at~Home is a mixed media artist concerned mainly with hand made felt using the wet-felt process. Her Etsy store holds a range of items from bags & purses, to felt sculpture and art-dolls. 3 Christmases ago my sister bought me a book on how to 'felt', and some wool.....I was fascinated by the process and had a go. Once I'd mastered the basics, I began to experiment. From there I started making the bags/purses which start with a hollow form - providing the 'head' of the purse. Then I felt either a body, in the case of the doll purses, or legs, fins antennae etc as is the case with the monsters, spiders, fish etc. The purses are given names and usually, during the creative process, they gain personalities. More recently I have been experimenting with felt sculptures. Many of these have little stories behind them, as with one called 'Isabelle, Gilbert & Mabel'. Ooohhh...that's a difficult one....there are lots of things. My parents have a place in rural France. I love to sit by the log fire, listening to the crackle, and watch a good thunder storm from the window. I guess ultimately I'm happiest when I'm making / painting / drawing.....I've always loved art. When I have a spark of an idea, and see it through to fruition...it's a great feeling when it all goes right. It's a fine balance between making things, keeping up to date with other artists, publicity and so on, as well as looking after a family. Just lately I've been working with vintage items, moving a little away from feltmaking. I'm fascinated by the imprint objects carry with them....the story of their lives. I collect things I am inspired by and wait to know what to use them for. I have started making poem reels. A vintage wooden cotton reel with a secret ribbon message wrapped around it. I would like to receive one of these with a personal message. They remind me of days gone by when the only way to deliver a message was by carrier...sometimes a small scroll attached to a bird. I'm not sure I ever really had a profession in mind. My Grandfather was a huge influence on my life. He was a gifted artist and I always admired that. I inherited his love of art and knew I would love to pursue it further. However, I didn't really have the confidence in my own abilities artistically, so trained as a nurse, which I did for over 10 years. www.littlebirdesigns.etsy.com - Jennifer's lino prints are wonderful! I have several & could buy the whole, shop! I love her style. www.stepanka.etsy.com - I think these ceramics are wonderful. Her porcelain wall pillows are inspired. www.thisisalliknow.etsy.com - I love Amanda's style. Her paintings are brilliant, the figures are often quite solemn and appear deep in thought. www.buttuglee.etsy.com - Jennifer's work is so fun and uplifting. I have one of her wonderful spiders which hangs in pride of place. I would like to pursue my love of art further. I am very fortunate that I am able to do what I do and be there for my children when they need me too. I think shortly I may open another shop on Etsy which will showcase my work in mixed media. I'm trained in jewellery & silversmithing and miss that immensely. In my jewellery designs, I prefer to use a variety of media - things with a history; a story of their own. I think my love of this will re-surface and that is ultimately the path I shall take. I will keep the feltmaking going too, but I think the two need to be separate. Visit Phillipa at feltathome.etsy.com and feltathome.blogspot.com. She is currently working on her 'colourful people' art dolls. Acording to Phillipa "They are 10 inch tall felt 'people'. They are designed for big people and aren't really toys. They are meant to speak of the fact that we are all colourful people.....we all have our own idiosyncrasies which make us who we are. " They are delightful. Go see! Did you know that Phillipa is one of my most favorite names on earth? Well, it is.